Wood thickness-9mm. Wood Rectangle Wood Window Box, Wood Planters. Removable Zinc Liner included. You are getting 1 wood box and 1 removable zinc liner. Color: Light Brown. Great for small plants, air plants or succulent. The best way to show off your simple gardening. With its natural appeal, this box is a great container for country style garden decor. For a stylish and contemporary arrangement, fill this planter with several different kinds of succulents, and use as an accent piece on your front porch. Wood thickness-9mm. Removable Zinc Liner included. Great for small plants, air plants or succulent. The best way to show off your simple gardening. The removable zinc liner make it easier to manage your plant. 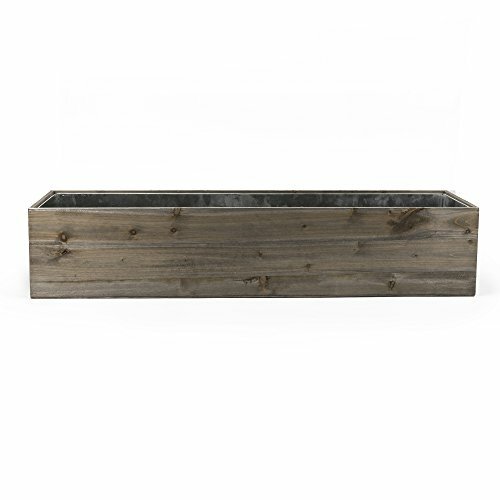 With its natural appeal, this box is a great container for country style garden decor.